Malice Mizer was a Japanese visual kei rock band active from August 1992 to December 2001. Formed by guitarists Mana and Közi, the band's name stands for "malice and misery", extracted from "Nothing but a being of malice and misery." — their reply to the question "What is human?" Their earlier music and themes were characterized by their strong French and classical influences, later moving away from deliberate French romanticism and incorporating Gothic aspects after several difficulties befell the band. Malice Mizer (stylized as MALICE MIZER) was a Japanese visual kei rock band active from August 1992 to December 2001. Formed by guitarists Mana and Közi, the band's name stands for "malice and misery", extracted from "Nothing but a being of malice and misery." — their reply to the question "What is human?" Their earlier music and themes were characterized by their strong French and classical influences, later moving away from deliberate French romanticism and incorporating Gothic aspects after several difficulties befell the band. 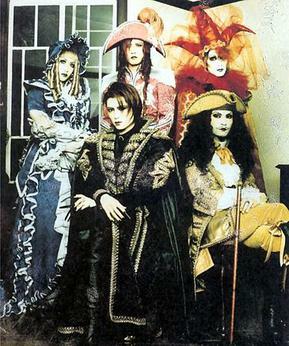 Malice Mizer was as famous for their music as for their live shows, featuring lavish historical costumes and stage sets, short silent theater pieces preluding various songs, and even a particularly notable instance of the vocalist descending to Earth (the stage) as a fallen angel, only to ascend again at the end of the concert. Throughout their history, the band has gone through several different lineups and three drastic image changes. On December 11, 2001, it was announced that Malice Mizer would go on an indefinite hiatus. Seven years later, Közi played on stage with Mana's Moi dix Mois for a session gig on December 27, 2008. In 2009, Közi went on a short two gig coupling tour with Moi dix Mois called Deep Sanctuary. A year later, in July 2010, he went on another tour with Moi dix Mois, this time with Yu~ki as a special guest at Akasaka Blitz on the 17. This was the first time in nine years that the three original members were on stage together. On November 17, 2012, the three members once again performed together, this time at Osaka Muse.